How have YOU used this sensor in your past projects? Here is something that I experimented with awhile ago with mixed results.· I was hoping to be able to·transmit Audio (wireless bug), or something along those·lines, but I couldn't get the·resonant frequency high enough·to make that practical.· Instead, low frequency vibration worked ok.· Now, I didn't spend a great deal of time with it, so it could be refined and possibly made to work. 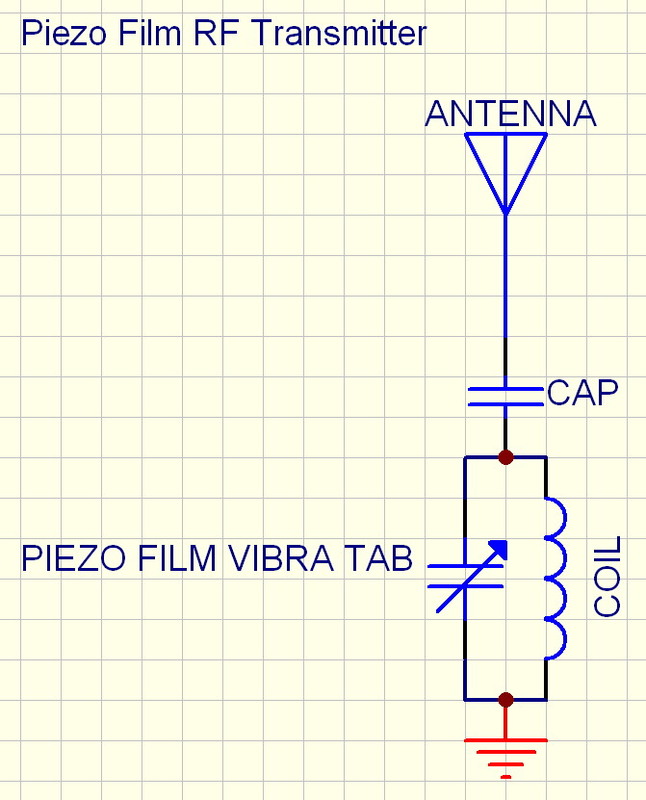 Another theoretical application for the Piezo Film Vibra Tab, that I would like to experiment with would be in the area of Surface Doppler Acoustics where you have two sensors equidistant from an acoustic source on the surface of an object , for example a table.· Based on where and how you touch the table you disrupt the signal being received by the Piezo Film Vibra Tab sensors.· A differential comparison would/could reveal the location of the acoustic disturbance. with an SD card/clock for logging. Shame I don't get that kind of activity here, or I might do it. Will the voltage change if I apply harder pressure if applied to·a flat surface? I would imagine there's a certain amount of force that has to be applied if·there's a 5.1 zener applied.· Can this force be generated on a flat surface (e.g. pressure)? I have one on the front door of my shop, responds to people knocking (or trying to break in) with a light display in the window that varies with the time and intensity. Yendor, be sure to download the Piezo_Technical_Manual.pdf from www.meas-spec.com, under the literature link. It has LOTs of applications in addition to good device info. You will see that one application is as an acoustic pickup, where the sensor is fastened to a surface like a drum or sounding board. The sensor has to stretch or flex, and static pressure will not work well unless it causes some stress and strain in the surface the sensor is attached to. Not constant, but changing. It gives an analog output, proportional, not on-off in the sense of a switch. It is more like a capacitor that accumulates charge as a result of flexing, and that charge will leak off into any resistance (MOhms) that is present across the sensor. In my opinion, the zener is not really necessary, because the sensor can't generate enough current to damage the Stamp anyway. The best thing to do is get one, and hook it up to an oscilloscope so that you can experiment for yourself. Thanks for the reference Tracy - I missed that on the web site. I'm seeing the light - thanks! I agree some experimentation is necessary, just wanted to make sure I'm going down the right path.